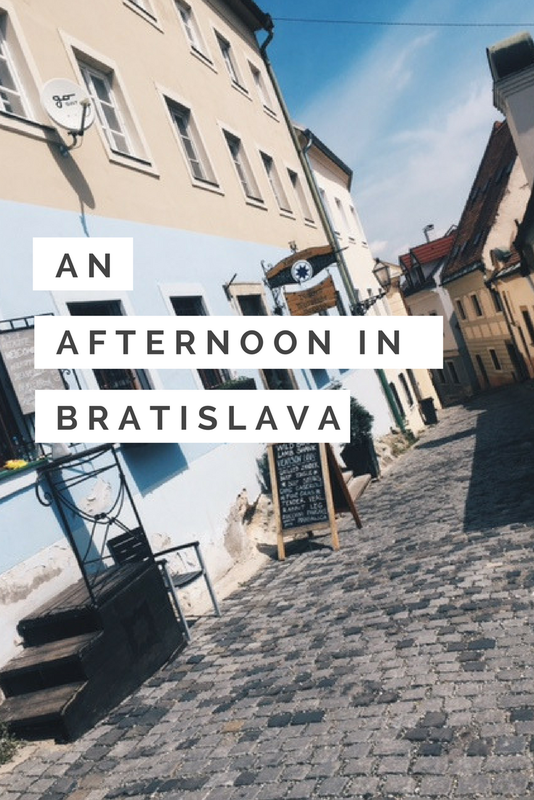 Before heading to Bratislava, Slovakia I was ambushed by mixed reviews from fellow travelers and online travel blogs about whether or not a visit to the city was worth it. However, afraid of hastily crossing it off my list, I decided to check it out for myself. After spending the afternoon in Bratislava I can say that I was pleasantly surprised but what it has to offer! After arriving by bus from Vienna (1.5 hours/7 euros one way) we walked from the main bus station into the old town. Although the walk was a comfortable 20 minute stroll, I would recommend taking one of the many public buses or trams if you are pressured for time. There are plenty of attendants that can help you with this when you arrive at the station. Due to the small size of the city, Bratislava’s main sites can be covered in a single afternoon. 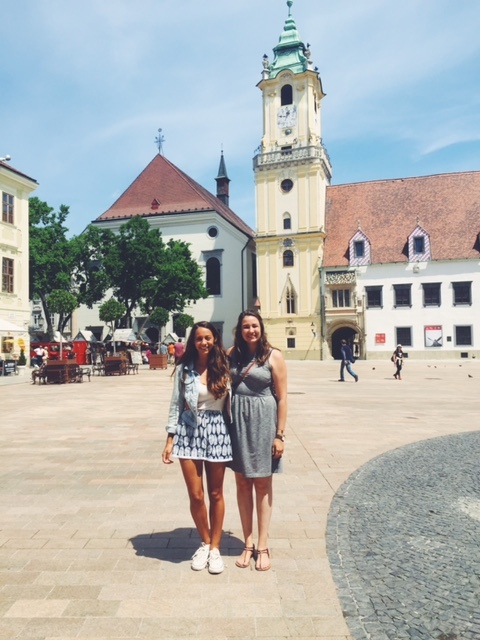 We decided to make the most of our time by visiting the Bratislava Castle, St. Martin Cathedral, Michael’s Gate, and the “man at work” sculpture. Unfortunately we lost track of time and had to skip out on the Church of St. Elizabeth, or the Blue Church (next time!). In terms of quaint cafes and traditional cuisine, Bratislava has lots to offer! There are plenty of lively streets that offer the perfect location for an afternoon drink, whether that be a chilled pint or a jar of homemade lemonade. I splurged on a glass of fresh mint lemonade and was not disappointed. 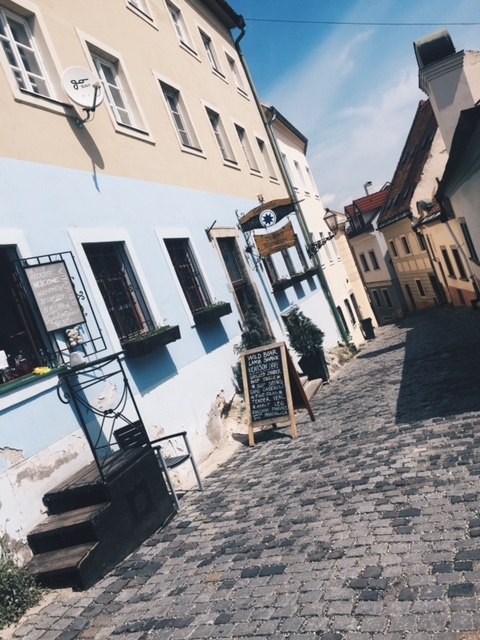 Although I feel that I got a good taste of the city in the 3 hours we spent exploring, I do not feel that we had enough time to fully appreciate all that Bratislava has to offer. If you are considering taking a day trip to Slovakia, I would recommend budgeting at least 5 hours, or even consider spending the night. Unfortunately our travel plans could not allow for this, and we had to rush off to catch our bus to Prague. Despite the hours on the bus, who can complain when there day consists of breakfast in Vienna, lunch in Bratislava, and dinner in Prague? !